Carol's Theatre Reviews ~ It's Fun To Go Out: San Diego Rep’s “Vietgone”: A Love Story and A War Story and A Story To Be Savored. 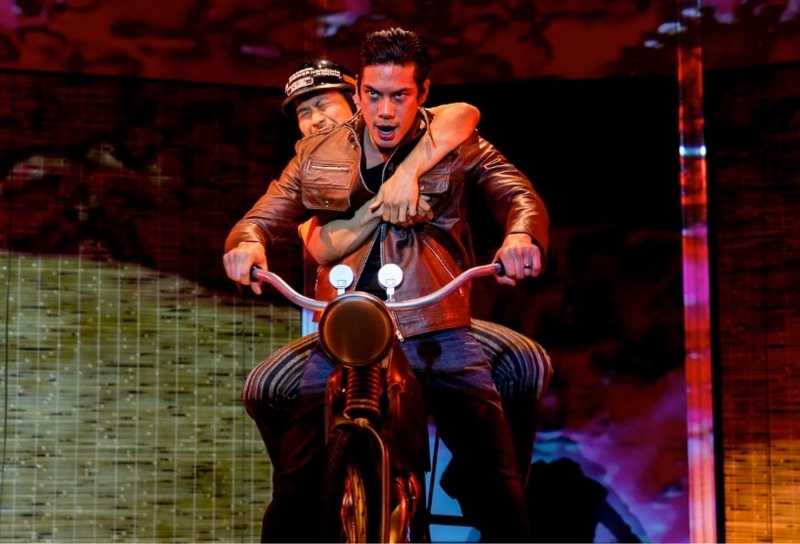 San Diego Rep’s “Vietgone”: A Love Story and A War Story and A Story To Be Savored. 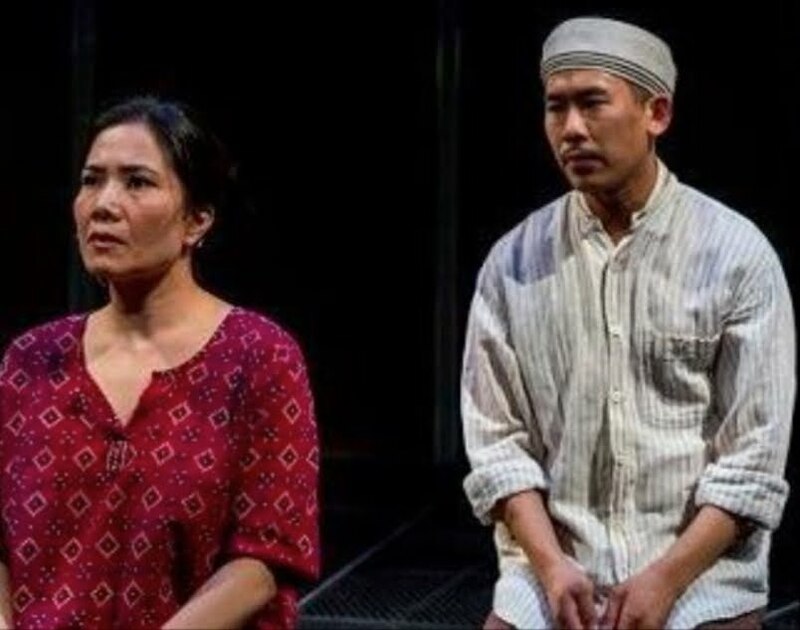 The San Diego Repertory Theatre in downtown San Diego is currently staging the San Diego premiere of Qui Nguyen’s “Vietgone” through Feb.18th. It’s a love story, a war story, as far as we know a true story and an original. I loved every one hundred twenty plus minutes of it. Off the bat, Bravo to director Jesca Prudencio and playwright Qui Nguyen. Nguyen’s story comes alive from the get-go when Shaun Tuazon (who plays no less than five different characters) steps to the stage and introduces himself as the playwright. He then reads off the customary pre show announcements: “Note the exit(s) (in this case the Lyceum has only one), candy wrappings, and cell phone turned off, no recording devices and we are off to the races. And then: ‘all characters in this work are purely fictitious? But. What? So one could say that everything is real as far as the eye sees, it’s just the way the eye sees it? Naw! Stick around. For years, my consciousness did not want to see, hear, and know any more about the war in Vietnam, having lived through ten years of it blaring out on our TV set with more images than I care to remember. And yes, I was one of those against our going there, staying there, losing ‘our boys’ there and treating them like dirt when they came back…and the fact we are still dealing with the drugs, the homelessness, the wounded and for all I know, a thousand other ongoing tragedies cause by our politicians’ lies, gnaws at me. His story changed my mind, rightly or wrongly in many ways. When I exited the theatre, I was sold. No spoilers here, but I do have a lot to think about. The story starts out in 1975 and flashes back and forth in time from the evacuation of Saigon by helicopter pilot Quang (Ben Levin is a beautiful hunk of a guy) to the USS Midway and then to a resettlement camp in Fort Chaffee, Arkansas. The accommodations might not have been the best, (they bitched about the food) but they were alive. However while Quang was busy rescuing the last of the free Vietnamese, his wife and two children somehow were left behind. At the camp he meets Tong (an exceptionally beautiful Katherine Ko) who has no qualms about having a few tumbles in bed, bunk or on floor with Quang, but is not ready for a serious romance. She is hell bent on assimilating. She plans to enroll in an adopt a family program to get her started on the road to getting work and ‘blend in’ with our American culture. Quang, who was familiar with our landscape (he was trained here in San Diego) is lonesome for his family and is on a quest to reunite with them. His plan is to bike it from Arkansas to Camp Pendleton and then hop a plane to Guam to and then fly back to Vietnam (undercover) and reunite with his family. With his friend Nhan (a perfectly wonderful Lawrence Kao) close behind, they bike it from Arkansas to Camp Pendleton. He then hopes to hop a plane to Guam, then a boat once there and reunite with his family. Overall these are some of funniest scenes in the show once the two are on the road and what and who they meet along the way. From Justin Humphries comic book projections, scenic and kaleidoscope backdrops of the rolling countryside, along with the horrific film clips of those trying to flee Saigon before it falls, to George Ye’s martial arts battles, to Bo Tindell’s lighting and whoever provided the next to disastrous looking rusted out junk bike the two rode from Arkansas to California to make this long trip the production is simply startling in it’s originality. Be prepared also for the characters to break out in rap that sounded a lot like the the rap in “Hamilton” (thank goodness for that ‘cause otherwise yours truly would have been in the dark. The lyrics are Nguyen and composed by Melanie Chen Cole (also sound designer). Without a doubt there isn’t a weak link in Prudencio’s cast. 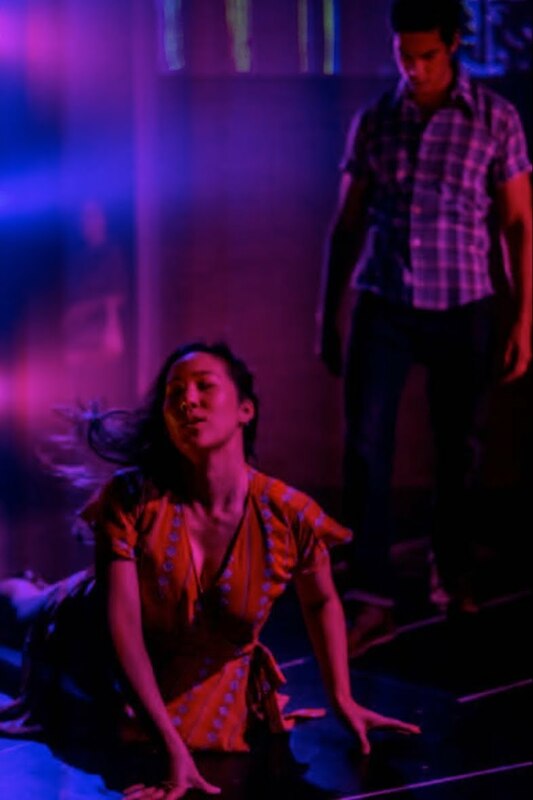 Ben Levin’s Quang, Katherine Ko’s Tong love making is steamy to say the least. Lawrence Kao’s Nhan and Emily Coligado’ Huong are perfectly suited as Quang’s best friend and Tong’s trashy mouthed - mother who just wants her daughter to settle down and have a family. Unfortunately, Tong doesn’t believe in marriage. We’ll see. But it’s Shaun Tauzon who takes the spotlight each time he’s on stage as one of his five different characters from playwright to hippy to Redneck Biker wrapped in the stars and stripes, to translator. He was last seen locally in “The Buddy Holly Story” as La Bamba. Such star power is not to be overlooked. Hats off to the Rep. for continuing to bring diversity to our community. Hi Carol!! Thank you so much for the kind words. It totally made me emotional when I read your heartfelt review. Are you able to edit the spelling of my last name in the article?